The Northrop XB-35 and YB-35 were experimental heavy bomber aircraft developed for the United States Army Air Forces during and shortly after World War II by the Northrop Corporation. 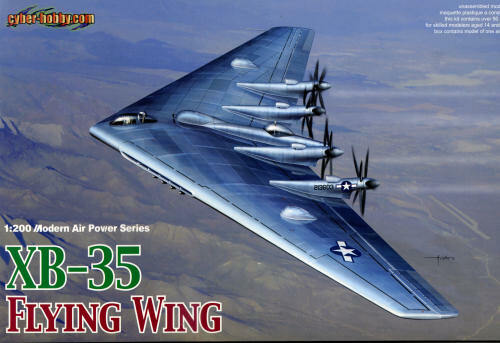 It used the radical and potentially very efficient flying wing design, in which the tail section and fuselage are eliminated and all payload is carried in a thick wing. Only prototype and pre-production aircraft were built, although interest remained strong enough to warrant further development of the aircraft as a jet bomber, under the designation YB-49. There is much more on this interesting aircraft at the reference link. In line with the other kits in this scale, the level of detail is really very good. 1/200 is darn small and so you will not normally find detailed cockpits or engineering stations in a kit of this size. However, Cyber-hobby does provide that detail for you so break out the 10/0 brush on this one. You will find that the wheels and props are going to be quite scale so one should take care in handling these, especially the wheels. Removing sprue stubs and painting them will be quite a challenge. The kit can be built with wheels up if you so desire, but the lack of an included display stand will cause many to shy away from that option. Kits of this scale are really perfect for 'in flight' displays so it is a shame one is not included. The only real option is to build it as the XB-35 with the contra-rotating props or the later YB-35 with single blade props. This is another superb offering from Cyber-hobby. It is particuilarly nice as even a 1/72 kit will take up a lot of shelf space, while this one, with a excellent beginning to a new aircraft line from Cyberhobby. I know of several folks who were less than thrilled with the Eduard kit due to the near impossibility of modeling it with panels closed and the somewhat dodgy fit. This one should alleviate those concerns and is less expensive to boot. Once a few projects are off my bench, this one is going there. Thanks to www.dragonmodelsusa.com for the preview kit. Get yours today at your local retailer.